For me one of the greatest revelations of Jesus’ birth is his vulnerability because points to and reveals our vulnerability. You may think you’ve got your life altogether thinking you’re invulnerable when all of a sudden a crushing chest pain drops you to your knees and the next thing you know you’re lying in a cardiac care unit hooked up to a dozen machines. And lying there looking around the room you suddenly realize just how vulnerable your life is. That would have been my story a year ago in June except there was no crushing chest pain no warning just the revelation I had a troubled heart and it needed fixing. With that life changing revelation I found myself in September following heart surgery experiencing firsthand the vulnerability of life, I felt like a helpless baby totally depending on others. Throughout the entire experience and even now I can hear God calling out to me not with an auditable voice but in the quiet assurance that to be vulnerable is to be blessed because the same guidance, protection, and support of the Holy Spirit afforded the vulnerable newborn Jesus comes to me as well. I don’t know what your invulnerable to vulnerable experience is but I do know from my own experience that in your vulnerability you will be blessed because the same guidance, protection, and support of the Holy Spirit afforded the vulnerable newborn Jesus will be yours as well. 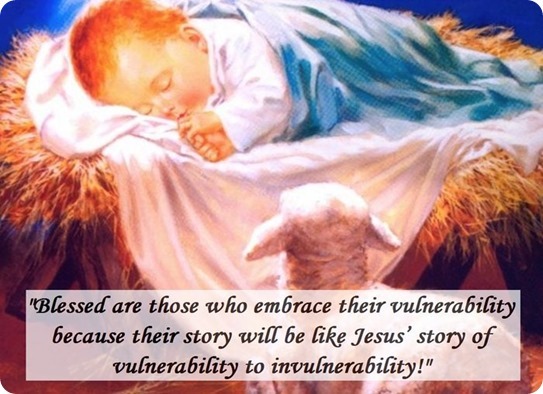 You won’t find this in the Beatitudes, “Blessed are those who embrace their vulnerability because their story will be like Jesus’ story of vulnerability to invulnerability” but its truthfulness is written on the pages of our lives! God, Grant us the gift of hope, patience and waiting in these Advent days because we want the focus of our waiting to be on you. We want to praise and glorify you with our lives. Let us live our gratitude to you, rejoicing! Amen.